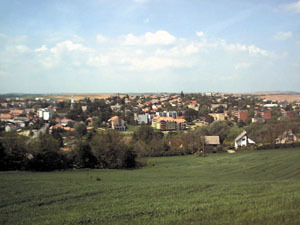 Central village with 5,100 inhabitants in the hills of Outer Somogy. 25 villages belong to its region. It is situated south of Lake Balaton, 25 kms from Siófok. It was first mentioned as the estate of the church built in 1320 in honour of apostle Saint Peter. In 1984 it was a village with the right of a town, it became a town in 1989. The Baroque Roman Catholic church, with frescoes by István Dorfmeister in the dome, was built in 1756. It was built in 1762. The Tab Gallery is a home museum of folk artist and wood carver Ferenc Nagy, who was born in Tab.Great son of Tab is Gyula Takáts, Kossuth Prize winner poet, who is a honorary freeman of Tab. The former Welsersheimb mansion built in neo-Classic style, is now used as an old people's home. The Mihály Zichy Memorial Museum is housed in the birthplace, and studio in later times, of the great painter, in village Zala in the vicinity of the town. The statue of Gyula Rudnay can be found in Bákonymegyer, 6 kms from Tab. The town with a special atmosphere in beautiful natural surroundings, its environs and the whole Koppány valley are ideal for people who want to relax.